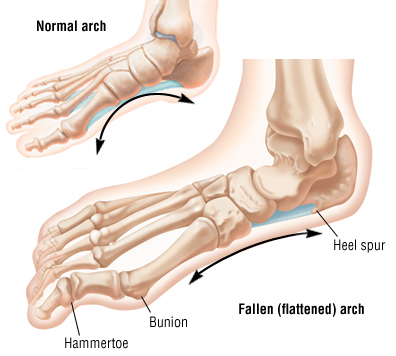 A fallen arch or flatfoot is known medically as pes planus. The foot loses the gently curving arch on the inner side of the sole, just in front of the heel. If this arch is flattened only when standing and returns when the foot is lifted off the ground, the condition is called flexible pes planus or flexible flatfoot. If the arch disappears in both foot positions — standing and elevated — the condition is called rigid pes planus or rigid flatfoot.